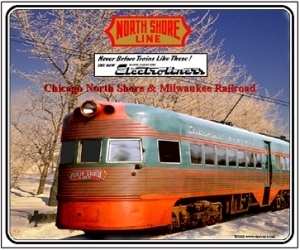 The Northshore Line operated those famous Electroliner train sets. Never before had there been trains like these. They served Electroburgers on board back in the day. One can be seen and maybe ridden at the Illinois Railway Museum. 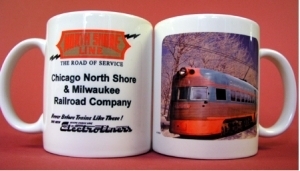 Colorful North Shore Electroliner interurban train set decorates this 11oz white coffee mug. An Electroliner may be seen and ridden behind at the Illinois Railway Museum. 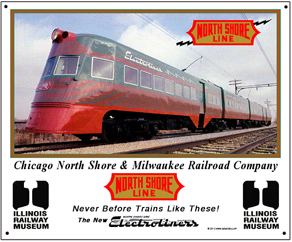 Colorful mouse pad featuring the Electroliner streamlined interurban trainsets of the North Shore Line. Never before trains like these. One can be seen and ridden on at the Illinois Railway Museum. 6 inch x 6 inch square tin logo of the North Shore Railroad. The North Shore Electroliner can be seen and riden today at the Illinois Railway Museum in Union Illinois, west of Chicago. Back in the day, you could buy "Electro Burgers" while riding this beautiful train!